Jack Butland's brilliant early save from defender Miguel Llera helped earn Birmingham a point against fellow strugglers Sheffield Wednesday. The England keeper, sold to Stoke last month but back at St Andrew's on loan until the summer, clawed out Llera's header from a Danny Pugh corner. Striker Nikola Zigic missed a great second-half chance for Blues. But neither side could break through, the draw ensuring both avoided slipping closer to the bottom three. Wednesday, who have lost only one of their last 11 league games, are two points clear of the drop zone. Butland's stop from Llera was crucial as Birmingham, who started and finished the night four points clear of the relegation zone, kept a first clean sheet in 18 league matches. But they might have been celebrating a victory had Zigic been more ruthless in front of goal. 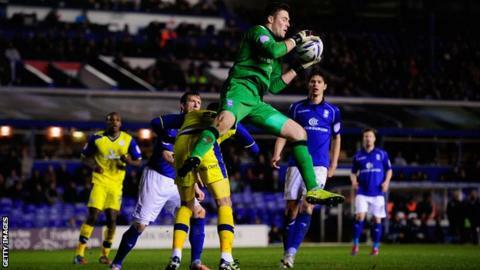 The 0-0 draw gave Birmingham their first clean sheet since a 2-0 home victory over Bristol City on 6 November. The Serbian striker had been restored to the starting line-up by manager Lee Clark, who had dropped him for Saturday's 4-0 defeat at home to Watford after publicly criticising his efforts in training. He could have marked his comeback with a goal, but failed to anticipate Chris Burke's cross and diverted the ball wide from four yards. Birmingham striker Marlon King, back in the starting line-up after a knee injury, had a great chance to open the scoring with just seven minutes gone but his attempted lob was collected by Chris Kirkland, who saved Wade Elliott's long-range effort shortly after. After Butland denied Llera, Zigic failed to connect with a great headed chance from Elliott's free-kick just before the half-hour mark. Zigic's big chance came and went midway through the second half, and he then headed Jonathan Spector's right-wing cross wide, moments after Kirkland saved a King shot. "Nikola's response was fantastic, absolutely brilliant. "I spoke with him on Monday morning and the two things I said were that I think he's an extremely talented footballer and I've got a lot of respect for him as a guy. "But he has to understand I've got my principles, my standards, my rules. He's showed tonight he's not just big in size, he's a big man as well." "I think you will need more than 50 points [to stay up this season] - I think it's going to be maybe 52, 53 points. "It's a crazy division. I hate it with a passion. The only predictable thing is the unpredictability about it."